Portsmouth senior Jasmine Eley signed her letter of intent to play collegiate basketball at Alice Lloyd College Friday afternoon during her signing ceremony. PORTSMOUTH – Alice Lloyd College in Pippa Passes, Kentucky has an undergraduate enrollment of just 610 students. 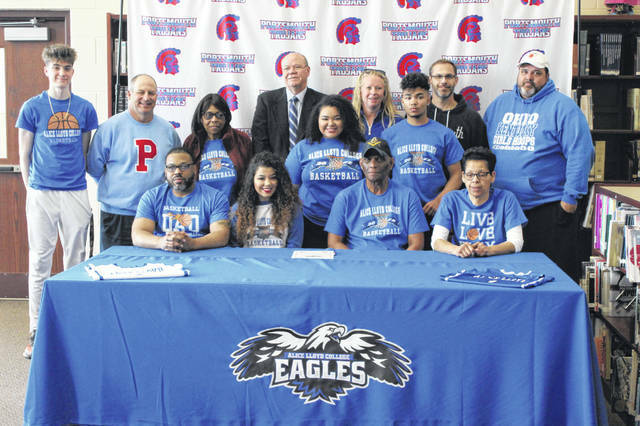 After signing her letter of intent Friday afternoon at her signing ceremony to join the Eagles on the court and in the classroom beginning the fall, Portsmouth senior Jasmine Eley will become one of 611 students attending Alice Lloyd. Eley finished her senior season for the Trojans averaging 14.5 ppg, 2.0 spg, 2.0 apg, and 2.0 rpg in her first season playing under head coach Amy Hughes. Alice Lloyd head coach John Mills is nothing short of ecstatic to be able to add a player of Eley’s caliber to his team for the 2019-20 season. Eley will always look fondly back on her time spent in the Trojan uniform and will keep a close watch on her teammates she’ll miss after graduation and new players who will join the team next season. Upon graduation from Portsmouth and enrollment at Alice Lloyd, Eley says she plans on majoring in criminal justice. Having such a big turnout at her signing surprised Eley, but she is ever grateful for them being there through every step of the recruiting and signing process.